Happy Holidays! The Islanders currently sit in 14th out of 15 in the Eastern Conference with 29 points. That is an all to familiar spot in the standings for the Isles. While this year was supposed to be a year that the Islanders would prove that they are a playoff team and potential Stanley Cup contender, this year has gone down the drain early. Here is some of what's up with this team. The Good: Since returning from a groin injury, veteran goaltender Evgeni Nabokov has been great. In the five games since returning, Nabby is 2-1-2. First, he shutout the Montreal Canadiens for a full three periods. 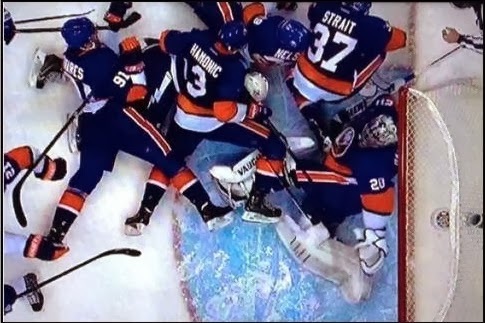 But since the Isles didn't score either, the game went to OT where Nabby couldn't make a save on a Max Pacioretty stop. In his last game in Detroit, Nabby was barely tested by a beat-up Red Wings team and got his 56th career shutout, first of the season. In five games since returning, Nabokov has a 1.96 Goals Against Average and a .928 Save Percentage, both great numbers that should help his team win if he keeps them up. The Bad: These photos from the end of the third period of the game against Tampa Bay don't need much explaining. The Terrible: Third Period Leads. 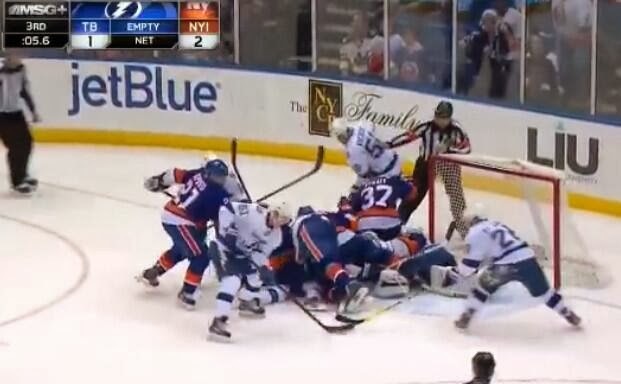 What is it with the New York Islanders and third period leads? In 38 games this season, the Islanders have blown a third period TEN times. If the Islanders had won all 10 of those games, they would be right in the middle of the playoff teams. In five of those 10 games, the Isles have blown a two goal lead. In those five games, the Isles are 0-2-3 after taking a two goal lead into the third period. Simply, the Islanders will need to be mentally tough and physically tougher in the third period if they want to have any chance at making the playoffs. At least Ryan Strome is here to save everybody. Happy Holidays to all and Lets Go Islanders!